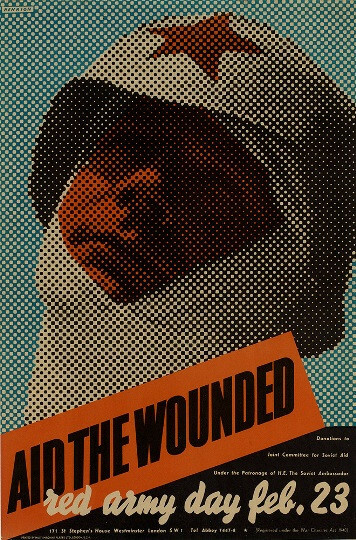 AID THE WOUNDED 1943 F H K Henrion (1914 – 1990)	© The Estate of F H K Henrion. All rights reserved. Frederic Henrion was born in Nuremberg. After studying in Paris he worked as a textile designer, in addition to exhibition, stage, graphic and industrial design. He left France at the outbreak of war and came to London, working variously for the Ministry of Information, the War Office and the American Office of War Information. After the war he established Henrion Design Associates specialising in total design and corporate identity. His clients included KLM, British European Airways and Olivetti. In 1973 the company was renamed ‘HAD International’ and in 1982 became Henrion, Ludlow and Schmidt. He was awarded an MBE for his work at the Festival of Britain in 1951, and was appointed a Royal Designer for Industry in 1959. He published Design Co-ordination and Corporate Image together with Alan Parkin in 1967. Henrion’s approach to design was varied, He made skilful use of photo-montage, such as the poster in the British Council Collection. The technique had been developed by the Dadaists and was adopted by avant-garde designers such as Henrion and McKnight Kauffer.